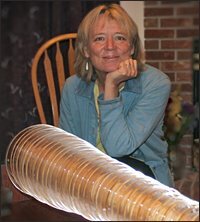 It was a treat to have author Dorothee Kocks at the blog June 18, 2012, talking about her novel The Glass Harmonica. How did it feel when you first heard music played on the glass harmonica? One spring day, I drove a few hundred miles to the nearest person with a glass harmonica. I had listened to recordings while writing the novel but I’d never heard the instrument live. A scientific glass company makes glass harmonicas today, and they are rare and quite expensive. I’d found this amateur musician, who prefers to remain anonymous, via the Internet … and it felt a little like Internet dating. When I arrived, he stood outside his garage patting his hands with paper towels. He had to get the oils off, he explained – which allows for a purer sound. Inside, we chatted a bit. When he dipped his fingers in water to start playing, he was trembling. I looked away. There was a Benjamin Franklin action figure on a side table; inspiring quotes on the walls. He played “Love Me Tender.” It took me by surprise - an Elvis tune? But it was so right. His fingers were sure on the spinning glass bowls. The sweet high notes hung in the air with such longing. It was different from a recording, as different as standing right next to a ringing bell versus blocks away. Tears sprang to my eyes. How can it be that we can feel so much at the touch of notes? I vibrated with the feeling of loving tenderly. I don’t know if I can ever thank him enough for daring to play for a stranger. An "enhanced" ebook companion to The Glass Harmonica was just published. What's your favorite enhancement? Henry Garland, Chjara’s husband, sells early American erotica. Researching, I stumbled on amazingly explicit images. I had no idea this happened in Puritanical America. So Such Were My Temptations: Bawdy Americans 1760-1830 was born. What’s my favorite find? Hard to say. I think a poem from which we made a video. It helped me understand what “ribald” means. Your characters are uninhibited for their time but question the appropriateness of their behavior, especially selling uninhibited books. Have you ever felt similar qualms about your own writing? I come from a sexually modest family and I didn’t want Henry to be who he was. But as a writer and as a person, I’ve come to trust the edgy places. If I stay with them, fear goes away. And then I can be more open to the people around me, the people before me. My heart can be more full.